Riding a bike at night can be dangerous. Sure reflectors and wearing bright clothing helps but sometimes, drivers simply aren’t paying that much attention to others on the road. With the Revolights Skyline Bicycle Lighting System, your bike is closer to normal headlights than ever before. Revolights doesn’t just light the way so it’s easier for cars to see bikers, they mimic actual headlights and taillights. The front light is white while the backlight is red. The taillight, as it were, includes a brake light. It blinks to let drivers behind you know that you are slowing down, which at night may be hard for them to see. The LED lights mount to the spokes and are rechargeable via USB. These are also theft proof so that you don’t end up spending a bunch of money just so someone can rip off your cool bike lights. Nothing worse than having your cool stuff stolen. These lights are designed to improve visibility on the roads to keep bikers and drivers safer. 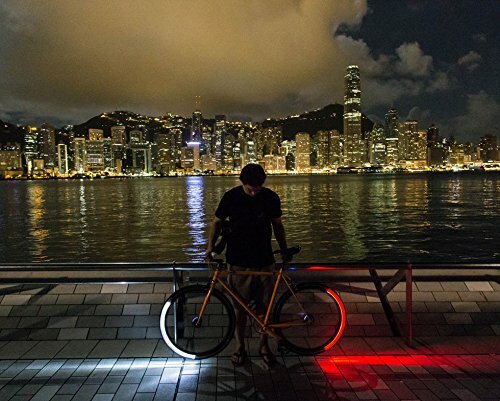 The Revolights Skyline Bicycle Lighting System is $199. Very nice except for the flashing brake light. Under Dutch law bicycle lights must be on when riding at night, flashing lights are not permitted.